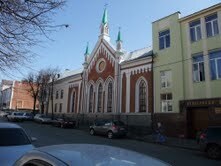 In 2003, Oak Harbor Lutheran Church partnered with St. Katharina Lutheran Church in Kazan, Russia. The mission is to create a spiritual bond and special friendship between the Lutherans of Kazan, Russia and the Lutherans of Oak Harbor, to provide mutual support through prayer and other assistance which will promote the kingdom of God, to obtain greater knowledge and appreciation for the traditions and mission of each church body, and to be transformed by the knowledge that no matter what our differences might be, we are all united in Christ. In 2005, nine members of Oak Harbor Lutheran traveled to Kazan to meet our brothers and sisters in Christ. After 83 years of use and misuse of the church facilities by the Russian secret police, St. Katharina’s sanctuary was returned to the Lutherans of Kazan. Revived from the long period of exile, St. Katharina Lutheran Church is working with parishioners in many ways: divine services, spiritual conversations, Bible readings, seminars, lectures, spiritual work, children’s Sunday School, and more. 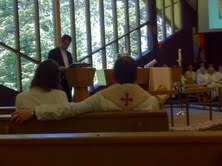 The work of deacons at St. Katharina is an important part of the community’s life, helping people facing many difficulties. 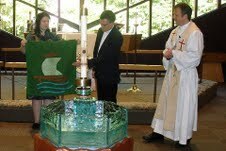 Since 2003, through the generosity and support of Oak Harbor Lutheran Church members, money has been sent to support the ministry of St. Katharina Lutheran Church, including support for building and furnace repairs, youth ministry, devotional books, hymnals, architect fees, work towards reconstruction of the building, the moving and installation of the organ, and the repairing and furnishing of the kitchen. 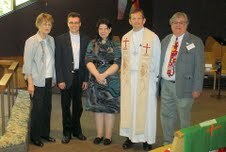 In May 2012 the partnership between Oak Harbor Lutheran Church and St. Katharina Lutheran Church was strengthened through a visit to Oak Harbor Lutheran Church from Dietrich Brauer, Bishop of the Evangelical Lutheran Church in European Russia (ELCER). Bishop Brauer was accompanied by Pastor Lena Bondarenko, the dean of Central Deanery, administrator of foreign relations, and coordinator of women’s ministry in ELCER. Bishop Brauer preached at the Sunday morning services and both the Bishop and Pastor Bondarenko gave a presentation at the Adult Forum. The people of Oak Harbor Lutheran Church were inspired and challenged by their witness, and we continue to enjoy frequent communications and a deepening relationship with all our Lutheran friends in Russia.